If your interest in plastic extends beyond your application at hand and you start to dig the chemical makeup and processes to make plastic you may come across the terms “amorphous” and “semi-crystalline” thermoplastics. 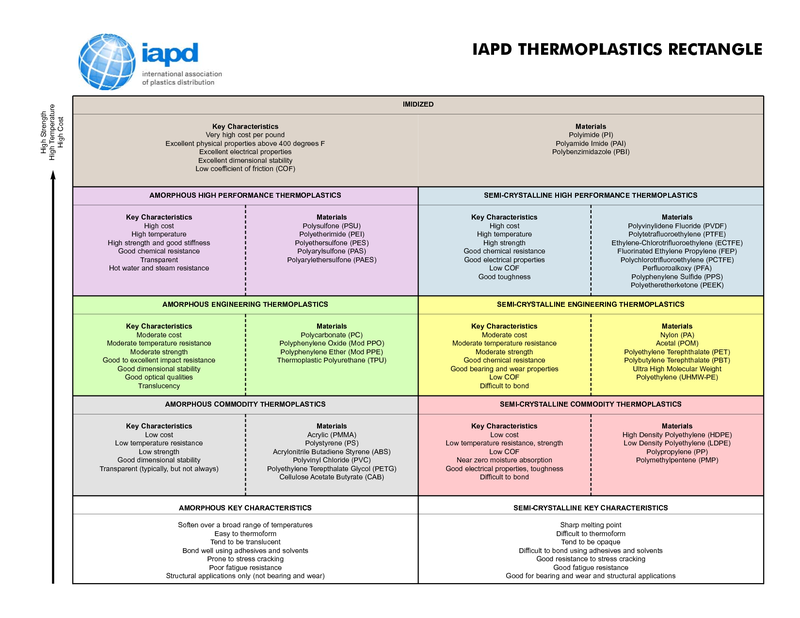 Literature from organizations such as the International Association of Plastics Distribution (IAPD) split plastics up into those two columns. This is useful as the plastics are almost mirror images of each other in regards to properties. Understanding the two types of thermoplastics may help you when starting to think of a plastic for your application. These are most of your clear plastics. They include polycarbonate, acrylic, PETG, ABS and polysulfone. Advantages of these plastics are that they are easy to thermoform, they soften over a range of temperatures, and they bond well using adhesives. When compared to semi-crystalline thermoplastics of a similar grade, amorphous plastics tend to have better dimensional stability and impact resistance. Drawbacks include amorphous plastics having poor fatigue resistance and are prone to stress cracking. These are most of your traditional plastics when you think of plastic “parts”. They include the polyethylene family (LDPE, HDPE, UHMW-PE), Polypropylene, nylon, acetal and fluoropolymers. Advantages of these plastics are that they are excellent for bearing, wear and structural applications. When compared to amorphous thermoplastics, these semi-crystallines tend to have better chemical resistance, electrical properties and a lower coefficient of friction. Drawbacks include semi-crystalline plastics being difficult to thermoform, difficult to bond, have a sharp melting point and only average impact resistance.